Teri Spam Musubi, originally uploaded by Eric Jeschke. SPAM (the meat product from Hormel Food Co.) is very popular in Hawai’i, and is a featured ingredient in a surprising number of local dishes. I’m told this stems from the war years when meat was scarce and in some cases rationing was implemented; in those years the increase of canned meat products was significant and I guess a popularity developed, which has strangely stuck, even though there are much fresher things that can be purchased at any grocery or farmer’s market these days. I tend to avoid such things in my diet generally, but I have to admit that after so many years in Hawai’i I my extremely low regard that I previously held for such things has gradually dissolved. 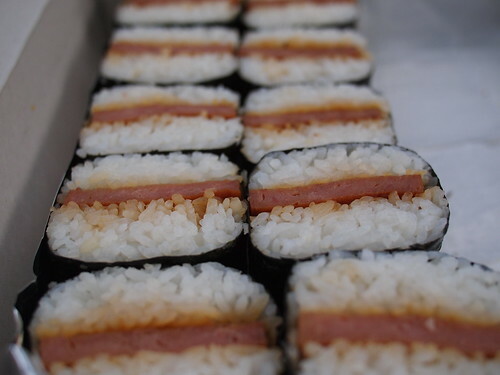 Once and a while I will mow down a SPAM musubi when they are offered, which is everywhere. Potlucks are very popular here and this batch was out for snacks after soccer practice for the kids the other day. I’ve really got to watch out for the shallow depth of field offered by the 20mm f1.7. In this shot (as with the one yesterday) I had adjusted the aperture for a shallow DOF, but didn’t realize just how shallow until I got home and had a chance to go over the images on the larger monitor. The focus is exactly where I had placed it, but I had intended for the very front elements of the frame to be slightly more in focus, meaning I need to remember stop down a little more with this lens. I guess this means you have officiall “gone Hawaiian”…. do you think you could fine Spam in Goshen, INDIANA? Sally, my feeling is that SPAM did not retain its popularity anywhere on the mainland US quite like it did in Hawaii, but I might be wrong; at least I’ve been to most of the 50 states and have never seen any kind of special like for canned meat. Those bizarre canned vienna sausages are also popular here, but I’ve never been able to bring myself to eat that yet.